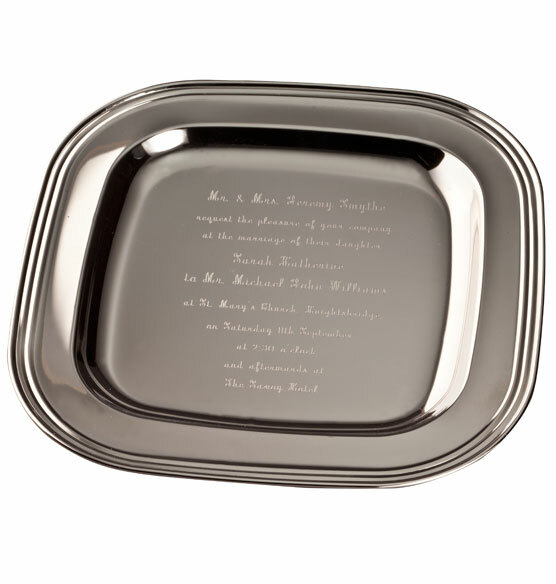 This invitation tray is how you create an unforgettable, one-of-a-kind special occasion keepsake. 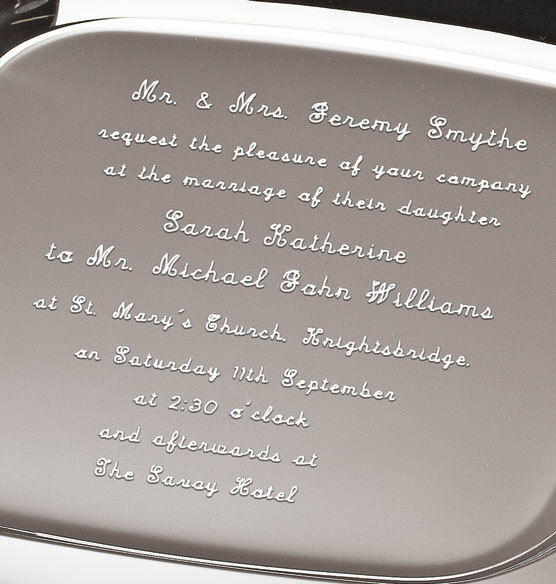 Beautifully engraved on a silver tray, this invitation is the perfect way to commemorate the details of your wedding or event. After the festivities are over, display the custom tray on an easel or coffee table as a shining memento of your big day. Can this be engraved with just a personal message rather than an invitation? BEST ANSWER: Thank you for your question. You can place any personalization on it as long as it fits in the limited characters. We hope this information will be of help to you. Once again I’m awaiting responses to my question of wording on line #2. That question has been: Your picture shows “request the pleasure of your company” and that is what we’d like to use but why is there not enough room on the form for such wording? BEST ANSWER: Thank you for your question. Unfortunately each line is limited to 30 characters, we apologize. We hope this information will be of help to you. Still waiting for answer to my question. Not sure y’all really care about my business? This is very frustrating y’all. The item of interest is shown above (right hand corner) right no this message. Called and “Invitation Tray”. As shown line 2 states “Request the pleasure of your company” — which is exactly what I’d like order but there are not enough spaces allowed when I try to personalize. One more try before I just simply say that dealing with y’all is just too time consuming, frustrating, inefficient, not-customer-friendly at all, etc. Waiting for answers to my questions please? BEST ANSWER: Thank you for your question. What is your question? My question is about Line 2. Your sample clearly shows the words “Request the pleasure of your company” as do so many invitations......as does the invitation that we’d like to have shown in this plate. HOWEVER.....there aren’t enough letters allowed in Line 2 to place even the words shown on your sample/marketing picture. What am I missing here? 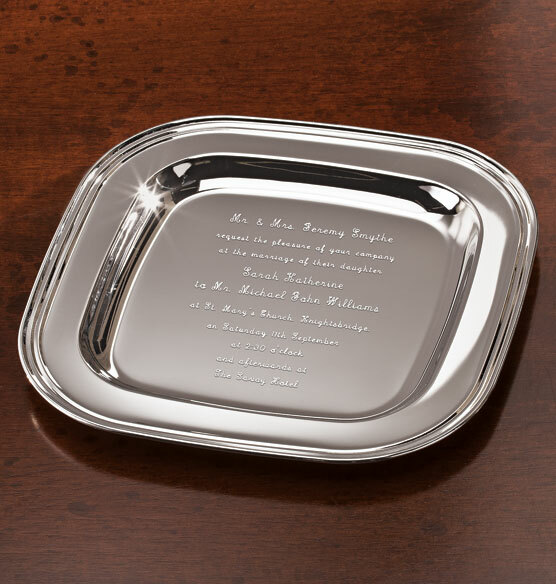 Good morning, I am interested in ordering a silver tray personalized with the invitation to my daughters graduation...would I need to mail you the invite to have the tray reflect what was printed? BEST ANSWER: Thank you for your question. You can purchase the tray on the website. To purchase, please click on personalize, once clicked it will than ask you for the personalization that you would like. We hope this information will be of help to you.